The Lancaster printer Joseph Ehrenfried gambled on the Martyrer Spiegel (Martyrs' Mirror) and he lost his shirt. In 1814 he published and printed the same martyrs' book that had put the Ephrata Cloister print shop on the bibliographic map, when they printed it in 1748. But luck was not with Joseph Ehrenfried. This hefty book broke his printing business into bankruptcy. Joseph Ehrenfried had arrived in Lancaster County from Hessen-Darmstadt, Germany in 1802. He had studied for the Catholic priesthood in Germany, but he never became a priest. Here in Lancaster County, Joseph began teaching school in East Donegal Township. Joseph then took a job in the print shop of Johann Albrecht, where he worked as translator and book keeper ...and where he learned the printing trade. In 1808 he and printer William Hamilton founded Lancaster's Volksfreund newspaper, although they broke up their printing partnership two years. 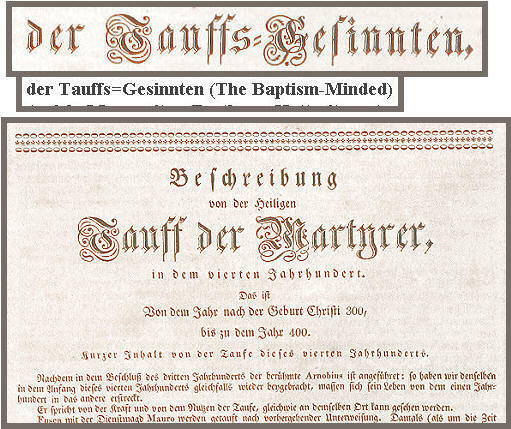 John Baer then bought this newspaper in 1817 ...and for 20 years Joseph Ehrenfried worked for John Baer. In 1816 Joseph Enhrenfried followed Francis Bailey's example, and joined the Swedenborgian church. Above: Joseph Ehrenfried's 1814 Martyrs' Mirror was beautifully designed and carefully printed. But fortune was not smiling on Joseph Ehrenfried. This book bankrupted him, and he was forced to work for the printer John Baer for the next 20 years. Eventually Joseph relocated to Harrisburg, where he printed German-language works for the State of Pennsylvania, during the governorship of Governor Joseph Ritner. Joseph then relocated to Allentown ...and then relocated, again, to Lancaster, where he stayed for the rest of his life. P.S. You can blame (or credit) someone in the Reist family for that clasp repair. I'm still trying to figure out if it's mostly ugly or mostly nice. My Relative, Samuel Fisher, was a Lousy Proofreader. Above: I have to be careful what I say about the unfortunate proofreading of this Amish bibliophile, because I think I am related to this guy. This 1937 Amish bookplate is glued into an 1814 Ehrenfried Martyrs' Mirror. 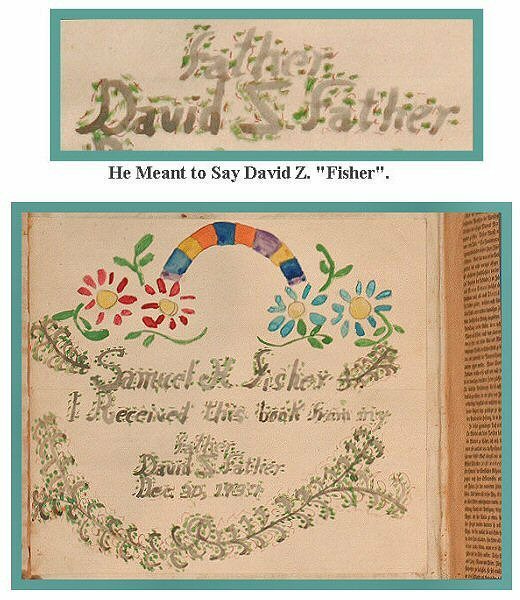 It is painted in watercolor by Samuel K. Fisher ...who misspells his father's name here as "David Z. Father". I checked my genealogy fan chart to see if I am related to Samuel. Just as I suspected. I probably am. My great-great-grandmother was Susanna Fisher (born 1795-died 1852). My great-great-great grandfather was Christian Fisher (born 1757 - died 1838). My great-great-great grandmother was Barbara Fisher (born 1779 - died 1869.) Most of my known ancestors are Amish. The good thing about American folk art is that you are allowed to like it even if it is bad art or bad proofreading. And sometimes, the worse it is, the more I like it. Above: The Amish / Mennonite hymnal know as the Ausbund is an icon of Anabaptist bibliography. 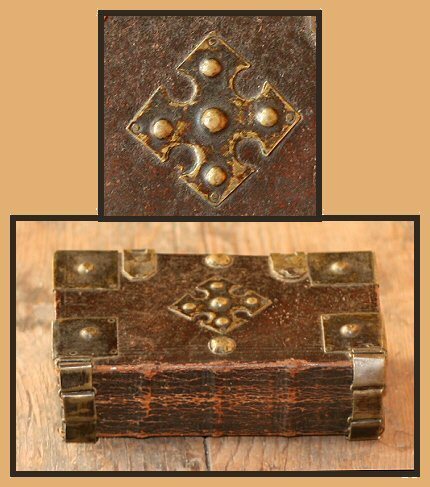 It is the oldest Protestant song book in continuous use. The earliest edition was printed in Germany in 1564. The Amish sing from the Ausbund every Sunday morning. 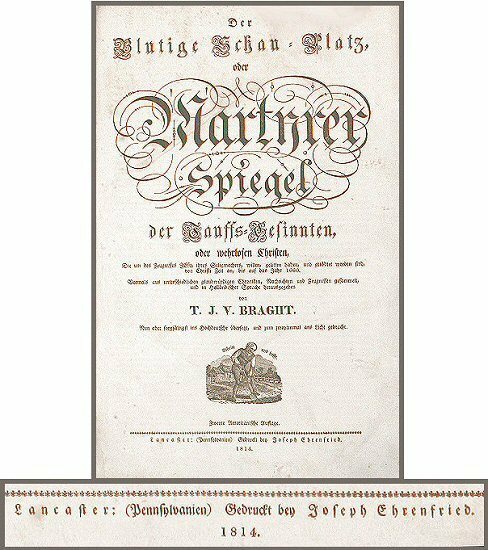 In 1815, the Moravian printer Joseph Ehrenfried printed the first Lancaster edition of this landmark title. Christopher Saur had printed the first American edition in 1742 in Germantown, near Philadelphia. 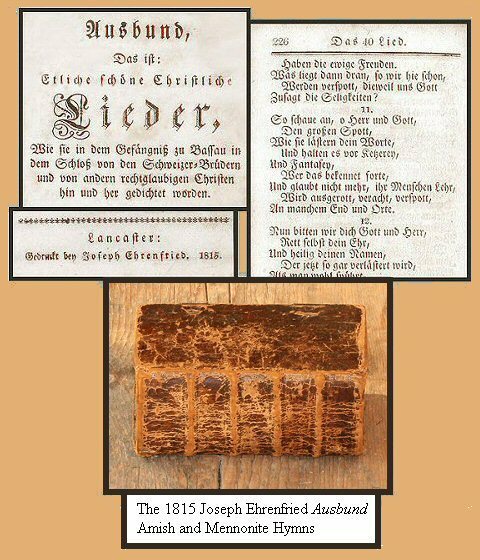 This 1815 Ehrenfried edition also includes stories about Anabaptist martyrs in Switzerland, dating back to the 1500s. This section includes information about the trials and tribulations of the ancestors of many Lancaster County Mennonite families, including family names such as Bachman, Landis, Hess, Weber, Snavely, Miller, Gochnauer, etc. 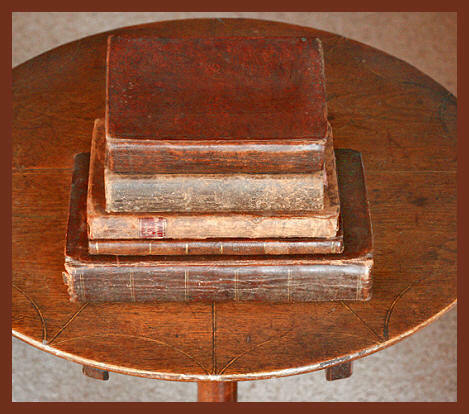 Above: Some Lancaster County families had brought their Ausbund hymnbooks with them when they immigrated from Europe. 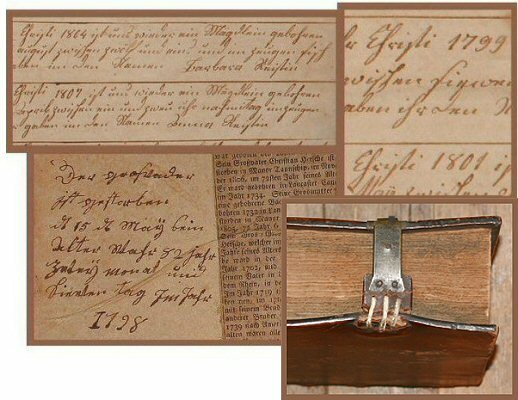 This heavy-metal Ausbund was brought here in 1719 by Mennonite immigrant Peter Newcomer. The book was printed by an anonymous printer in Basel, Switzerland, circa 1700. The book was later owned by Hans Brubacher (born 1719 - died 1804) of Elizabeth Township, Lancaster County. That aggressively-armored binding has protected the pacifist hymns inside for more than 300 years. 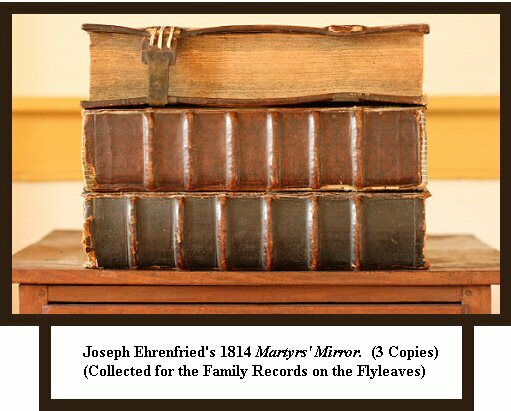 Above: Joseph Ehrenfried bit off more than he could chew, when he published a large edition of the Martrys' Mirror in 1814. The book didn't sell well, and a few years later he was bankrupt. Thomas von Kempen Vier Bücher Von der Nachfolgung Christi by Thomas à Kempis. 1810. Enchiridion oder Handbüchlein, von der Christlichen Lehre und Religion by Dietrich Philip. 1811. Agathon on Divine Worship. 1812. Der wahre und selige Weg by Johnannes Herr. 1815.